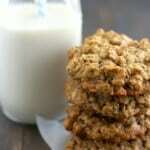 Home » Breakfast » Oatmeal Applesauce Cookies. These oatmeal applesauce cookies are the perfect homemade treat to pack in a school lunch or eat for a quick breakfast! Disclosure: This conversation is sponsored by WhiteWave Foods. The opinions and text are all mine. Doesn’t it feel like summer just started? And yet here we are, it’s almost August! And although I fully intend to soak up the last month of summer, I do know that most families are starting to think about going back to school. Heading back to school means shopping for and preparing healthy breakfasts, lunches, and snacks. Fortunately, it’s easy to shop for healthy foods at Kroger. 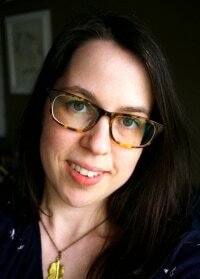 When I was offered the chance to talk about Kroger’s Natural Foods Department, I was so happy to accept, because we shop at Kroger all the time. Our Kroger has a really nice Natural Foods Department and I am always so happy to see so many of the brands that I use and love, and I’m especially pleased with the prices on these items! Kroger’s Natural Foods Department has so many options for healthy breakfasts and snacks. They also carry many items that work with special diets. You can find gluten free, dairy free, nut free, and other allergy friendly snacks in Kroger’s Natural Foods Department. What’s the most stressful part of the school day? The mornings, right? The mornings can be so rushed when you’re trying to get out the door. Sometimes it’s difficult to eat a healthy breakfast! 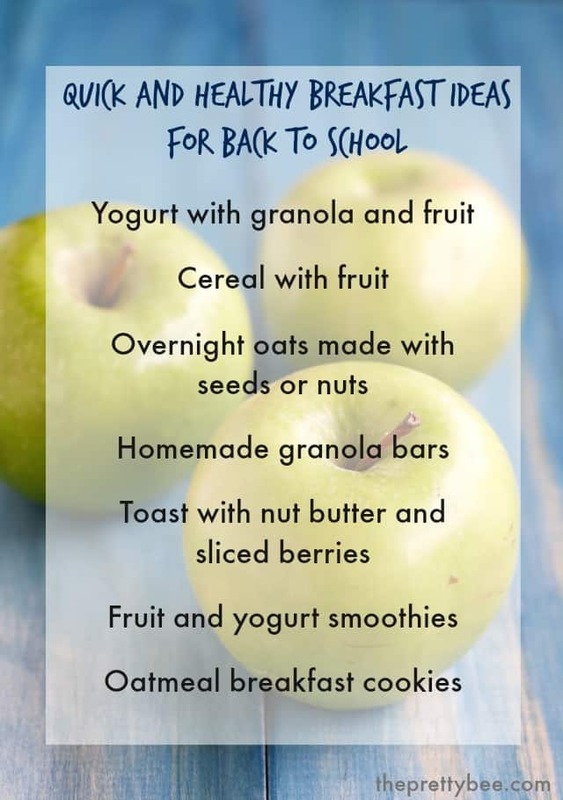 I thought I’d share some ideas for simple and healthy breakfasts for the school year. The best part is, all of the ingredients for these healthy breakfasts can be found in the Natural Foods Department at your local Kroger store. 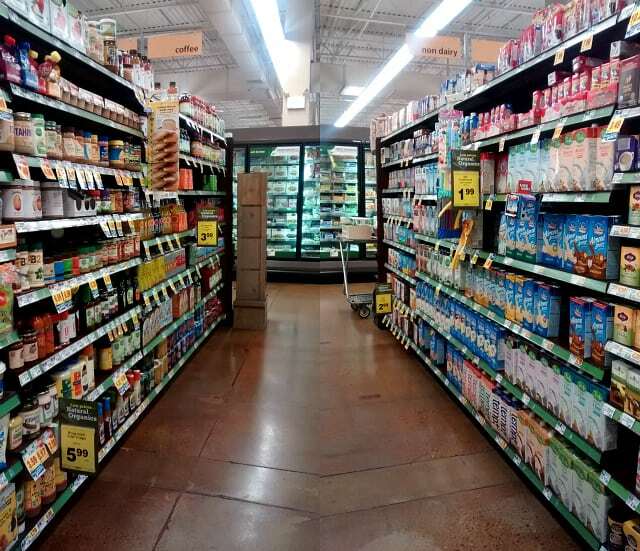 I regularly buy coconut milk yogurt, non-dairy milks, flax seed, chia seeds, oatmeal, steel-cut oats, dried fruit, gluten free bread, cereal, sunbutter, and more at Kroger. Having a pantry filled with these healthy ingredients makes it easy to put together nutritious snacks and breakfasts! One of my favorite easy grab and go breakfast options is the breakfast cookie. 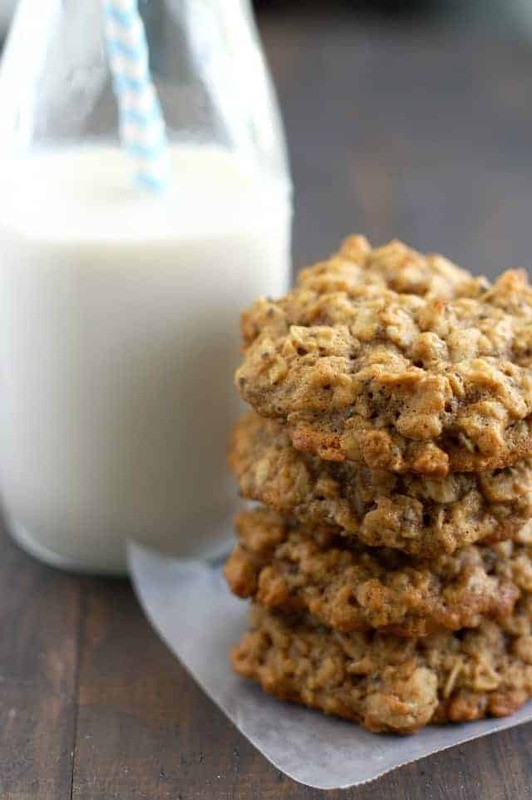 These oatmeal applesauce cookies are made with lots of whole oats, chia seeds, flax seed meal, and cinnamon for a healthy and comforting start to the day. I love adding flax seed meal and chia seeds to my baking because it’s a great way to get some extra fiber, omega-3’s, iron, and calcium in my diet. These cookies have a great chewy texture and are full of fiber, making them perfect for a quick breakfast or after school snack. One of the brands that I often purchase in the Kroger Natural Foods Department is Simple Truth. 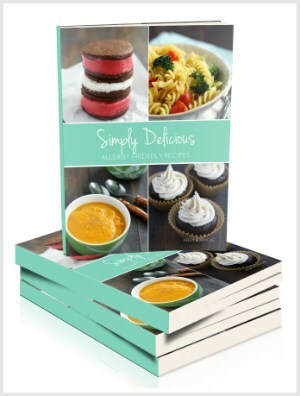 Simple Truth products include organic and natural items that are delicious and affordable. 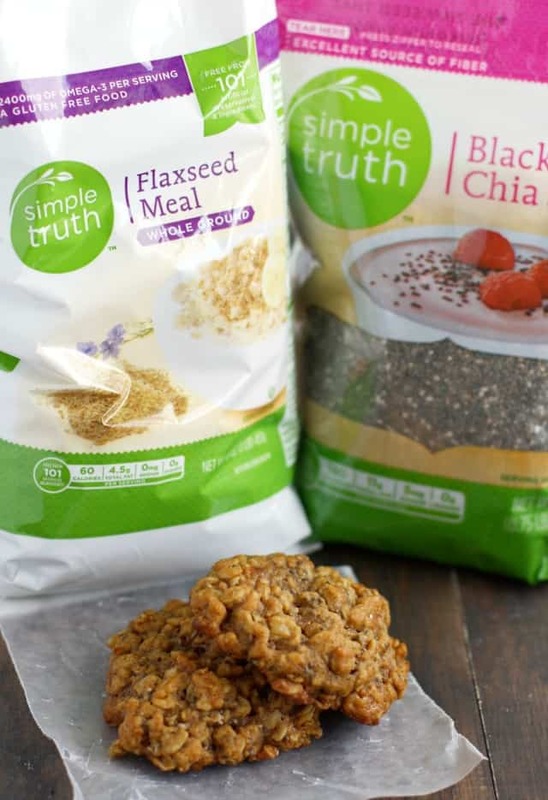 Some Simple Truth products that I purchase regularly include chia seeds, flaxseed meal, cereal, organic sugar, rice crackers, and other snack items. Simple Truth is a label that I have grown to trust for its high quality and affordable price. And of course, if you’re having cookies, you can’t forget the non-dairy milk! Oatmeal applesauce cookies are best when you have a cold glass of Silk Coconut, Soy, or Almond Milk to go along with them. You can find Silk products in the Natural Foods Department at Kroger. 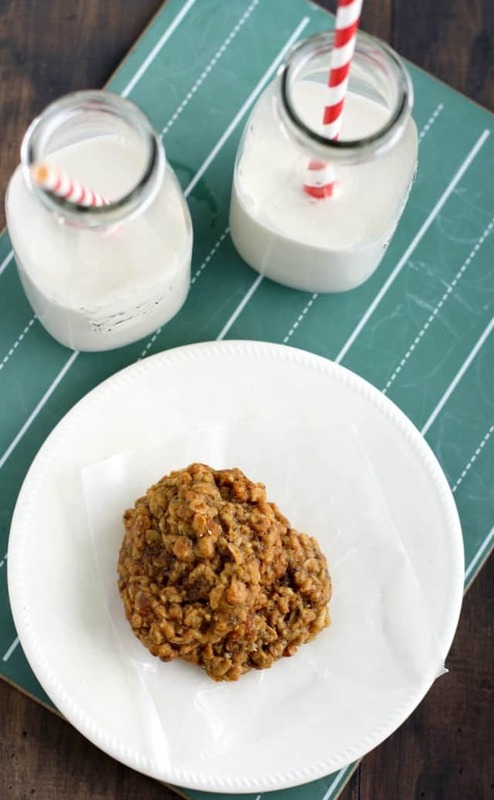 Chewy and delicious oatmeal applesauce cookies - perfect for breakfast or a snack! Make the flaxseed egg replacer: in a small bowl, combine the flaxseed meal with three tablespoons of water. Let it sit for a few minutes until it becomes a gel. In a large bowl, cream the vegan buttery spread, coconut sugar, and organic sugar on high speed until fluffy. Add the applesauce, vanilla extract, and the flaxseed egg replacer, and mix until combined. Add the flour, salt, baking soda, and cinnamon, and mix until incorporated. Turn off mixer and add the oats and chia seeds. Stir with a spoon to combine. Drop the dough by rounded tablespoons onto the cookie sheet. Bake at 350 degrees for about 12 minutes. The cookies may look a little underdone in the middle, but that's okay. They will continue to cook as they cool. Do not over bake. Let cool on the cookie sheet for about 10 minutes, then remove and let cool fully on a wire rack. Be sure to visit Kroger’s Inspired Gathering for Recipes, DIY and Decor, Tips and Tricks, and Cleaning Hacks. How will your family stay healthy while heading back to school? 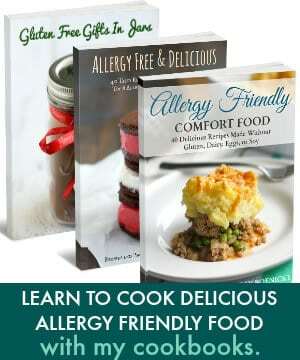 « The Allergy Free and Delicious Ebook is Here! Also need recipes that are needed for osteopenia problem & low carb with minimal amounts of cane or brown sugars! I am pre-diabetic & need to protect my heart, kidneys & liver from too much carbs & sugar load that turns into stored fat. Do you use healthy fats like avocado in your recipes? Can I substitute coconut oil for a product that is processed like Vegan Buttery Spread? I need to learn what other substitutions for sugars in a vegan type diet!!? My son is type I diabetic! I have a few avocado recipes on my site, like avocado dip and avocado pudding. Sometimes you can use coconut oil in place of vegan buttery spread, but sometimes it won’t work. It would depend on the specific recipe. I just made these, and they taste great! Mine happen to be pretty crumbly. Is that how yours are? 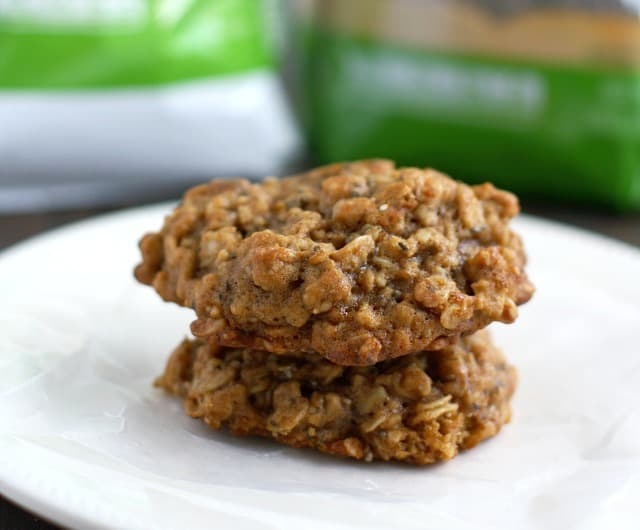 You had me at healthy cookies – love that you did an oatmeal cookie :) So good! I know for a FACT I would adore these cookies. YES I WOULD! I can even taste them in my mouth already, even know I haven’t had oatmeal and apples in YEARS! These look delish!! So much good stuff for breakfast! Pinned! These sound absolutely fantastic! I can’t wait to try them! I really like how your used both the flax and chia in this, what a superfood combo! These cookies are so healthy and cute and love that they are vegan! I don’ have any kids, but these cookies look like they would do just the trick for me. Sounds delicious, Kelly! 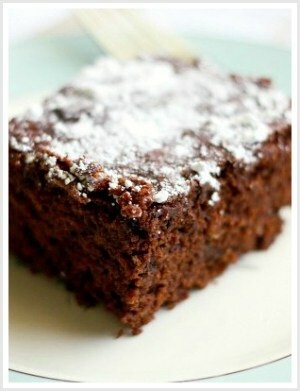 Love the use of applesauce in these babies!